After a “picture perfect launch” on November 26 last year and a 254 day voyage to the red planet, Curiosity (officially the Mars Science Laboratory) was primed to descend to the Gale Crater on the Martian equator. And you didn’t need to be in the NASA control room to watch the landing – you could (and should) have headed over to NASA TV or Ustream to experience this wonderful moment. Landing an 899kg specialised roving science laboratory on Mars has been an audacious mission. The mass of the rover presented new technological challenges to NASA engineers. The airbag landing method used successfully on three previous rover missions was not a viable option for Curiosity. That gave NASA engineers the opportunity to trial technology that could be used for later human exploration missions. As Curiosity entered the Martian atmosphere, 125km above the planet’s surface, it was travelling at roughly 21,960km/h. Then began the much-publicised “Seven Minutes of Terror” – a self-guided descent1 to the surface. 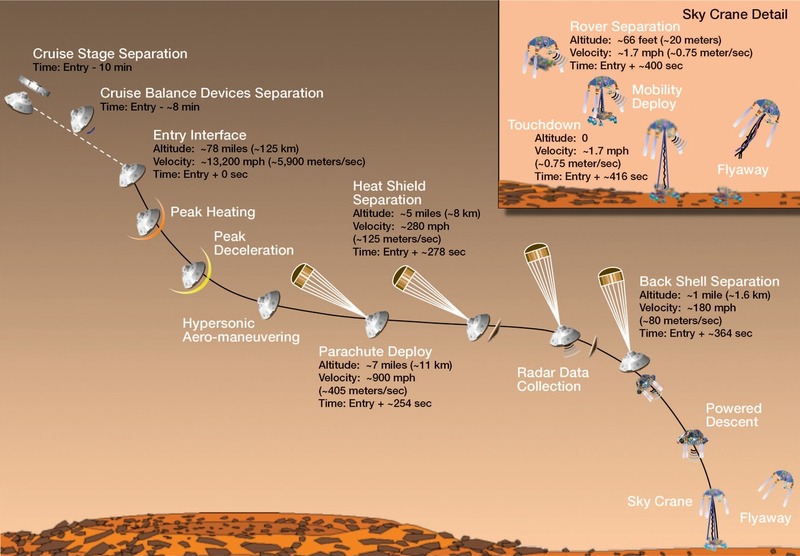 Although NASA initially used this description for the May 25, 2008 landing of the Martian polar lander, Phoenix, it was still apt for the current challenge. Of the 38 Mars space missions (fly-by, landers and rovers) since 1960 only seven have been successful. Curiosity’s guided descent is still considered less risky than that experienced by Spirit, Opportunity, and Viking 1 and 2. As for past missions, the NASA control room was a sea of crisply ironed blue NASA/Jet Propulsion Lab shirts and the landing was accompanied by gleeful shouts, smiles, plenty fist-pumping and manly hugs as well. Curiosity started taking pictures before it landed. As it descended toward the Martian surface it acquired low-resolution colour pictures from its Mars Descent Imager (MARDI). Those initial colour images will help pinpoint the rover’s location. They, as well as one full-resolution image, are expected to be released tomorrow. Within minutes of landing, Curiosity started taking its first, low-resolution, black and white images. 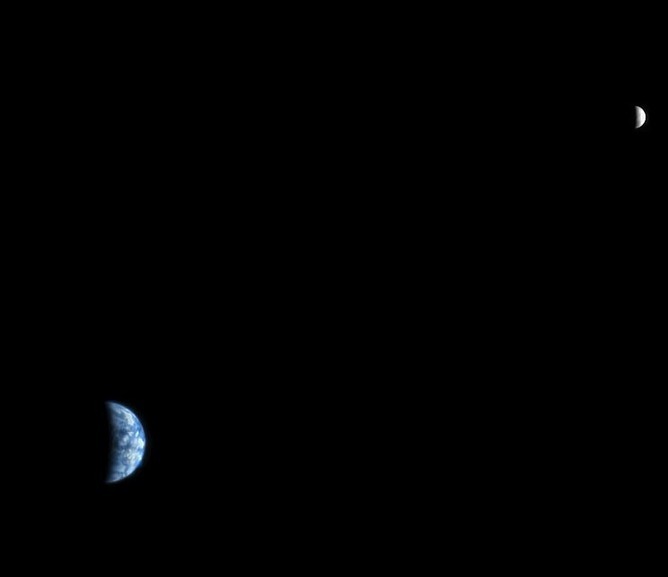 Those very first pictures from the surface were scheduled to arrive more than two hours after landing, due to the timing of NASA’s signal-relaying Odyssey orbiter. Those first views, when they arrive, will give engineers a good idea of what surrounds Curiosity, as well as the craft’s location and tilt. Once engineers have determined it is safe, they will deploy the rover’s Remote Sensing Mast and its high-tech cameras, a process that may take several days. And then Curiosity will start surveying its exotic surroundings. Additional colour images of Mars’s surface are expected another 12 hours after landing courtesy of the Mars Hand Lens Imager (MAHLI). This camera, located on Curiosity’s arm, is designed to take close-up pictures of rocks and soil. When Curiosity lands and its arm is still stowed, the instrument will be pointed to the side, allowing it to capture an initial colour view of the Gale Crater area. 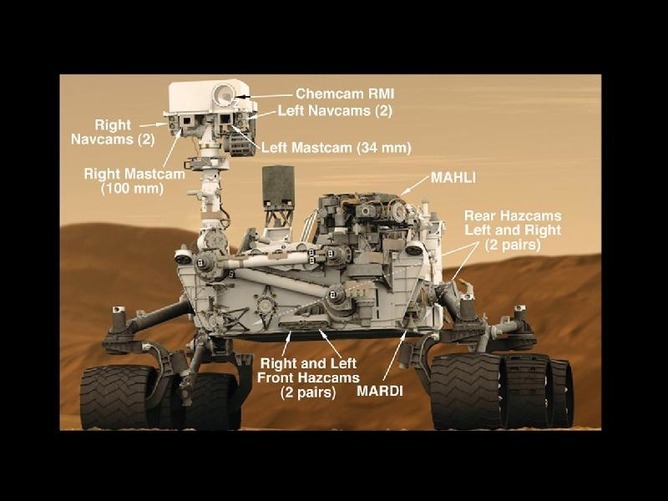 Once Curiosity’s mast is standing tall, the Navigation cameras will begin taking stereo pictures 360° around the rover. These cameras can resolve the equivalent of a golf ball lying 25 metres away. They are designed to survey the landscape fairly quickly. If the mast is deployed on schedule, expect to see these pictures about three days after landing. As mentioned, the landing site is Gale Crater, an ancient impact crater 154km in diameter. It holds a mountain rising 5km above the crater floor. The Gale mountain offers one of the deepest continuous rock layer sequences in the solar system, providing access to an unprecedented cross-section of Martian geological history. The slope of the mountain is gentle enough for Curiosity to climb. During its primary mission Curiosity will travel approximately 20km in total, exploring areas around its landing site. The pace at which Curiosity gets to the features of high scientific interest will depend on a number of things: the findings and decisions made now it has landed, including the possibility of finding the unexpected! I experienced the first moon landing. I was also one of the geeks at the CSIROTweetup for the Curiosity launch last November. And I witnessed today’s historic event, joining others at the Canberra Deep Space Communication Complex. In Melbourne, the Space Association and the Victorian Space Science Education Centre partnered to put on a landing party as well which was open to the public. I hope you took advantage of this opportunity to experience history as it happened.